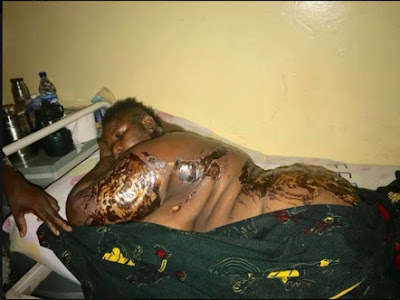 A woman has landed in the hospital after she was attacked with acid by her ex-lover in Anambra state. The young man in question is said to be younger than her, hence his family insisted that their son would never marry an older lady. The lady’s family also concurred, but the young man wouldn’t give up, it was alleged. According to Tobenna Obiano, things got so bad when the lady insisted that they must path ways to respect their families and their excuse of age. But the young man insisted that if he doesn’t end up with the lady, no one else would have her. It was alleged that he had once attacked her – the man had once sneaked into her room at night and tried to strangle her. Neighbors rescued her, but she never made any formal report to the police. After that, the young man sneaked in through the back door, and saw as his supposed girlfriend was about unlocking her door, he poured a bowl of raw acid on her running down towards from her neck region, ear, back section and br*ast. He poured a second one again on her, extending from her back down to all-over her buttocks and even towards her laps. 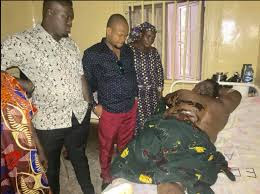 The lady has since been transferred from a hospital in Awka to an Orthopedic hospital in Enugu state, where she’s currently being treated.